Ship’s Log: Saga Pearl II, somewhere south of Madeira, due to arrive Funchal 1830 this evening. Wind, NNW 5-6, sea state moderate (2-3m swell). Weather: cloudy, temperature 15 degrees. Preparation for this afternoon’s art class done, forecast for lunch: imminent and looking good. Did I say I was not cruising this winter? 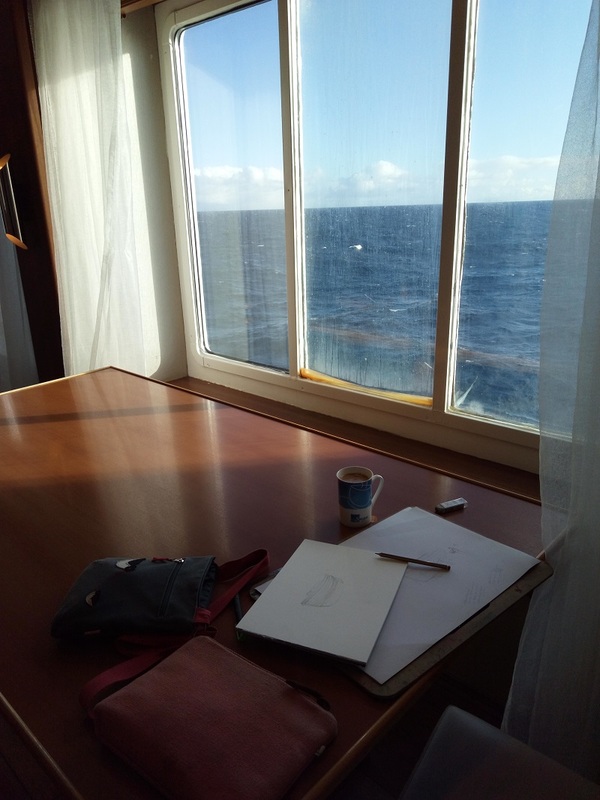 I changed my mind, on a particularly chilly and rainy day when an email arrived from the agency asking if any art tutor was possibly free to jump on board Saga Pearl for a 17 day cruise at very short notice. Well….. what would you have done? Luckily, my diary was reasonably clear and a bit of winter sun was an opportunity waiting to be grabbed. We’ve stayed fairly close to home this time – Portugal, Morocco, Canaries and now Madeira, then home. The weather has been pleasant most of the time (in Tangier and Arrecife I was seen to remove both cardigan and socks!) 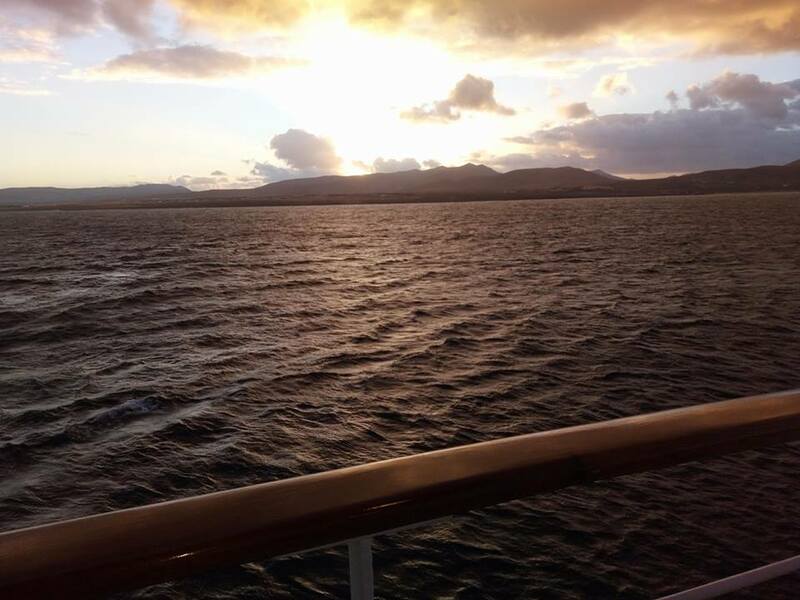 but at Las Palmas in Gran Canaria a storm was brewing so we stayed safe in harbour an extra day whilst strong winds and lashing rain reminded us of home – though thankfully without the sub zero temperatures. 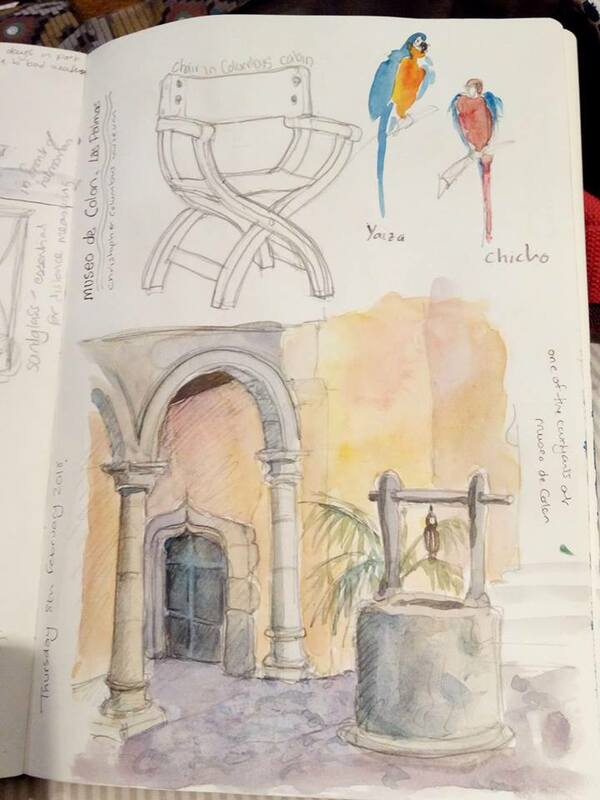 Cardigan, socks and waterproof jacket firmly back on I spent a pleasant time in the Christopher Columbus museum, which is a delight. 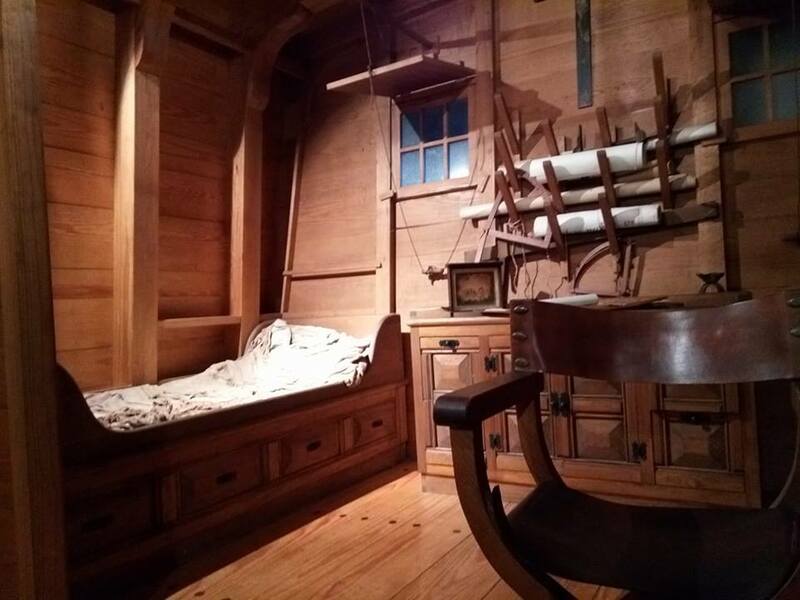 Replica of Columbus’ cabin – much bigger than mine, though of course he is the captain! I have a question for you maritime history experts out there. The steering position on Santa Maria and other ships of the period was below decks, a tiller arrangement linked to rudder by ropes and tackles. The helmsman had a compass and also a sand-glass in front of him (essential for both timekeeping and calculating the ship’s speed), but of course he could not see where he was going. My questions are these: how were instructions passed down to helmsman from lookouts on deck? And was there any way of steering from up on deck (steering oar?) when needed? And at what stage in history did ship designers realise that it was rather useful if the man at the helm could see where he was going and move the tiller (later wheel) up on deck? Sensible suggestions welcome! Thank you. On board Saga Pearl II the captain and officers are of course high on the bridge with an array of electronic instruments that would be the envy of Columbus and fellow explorers. 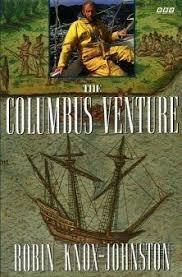 I recommend a book written by Sir Robin Knox-Johnston called ‘The Columbus Venture’ (BBC Books 1991) in which Robin sails across in the Atlantic using only instruments available to Columbus. I won’t tell you where he ends up, that would spoil the story, as it’s a good read. That’s enough about Columbus for now. In the next blog post I’ll tell you why it’s of such interest at the moment (apart from the fact that I love the detail and the human story of maritime history). Meanwhile, the Atlantic rolls by the lounge windows on this little ship with its 450 passengers and nearly as many crew. I always bring plenty of work along to get on with in my spare time, but there was only one deadline that needed my attention and that’s the monthly cartoon for Dave Selby’s ‘Mad about the Boat’ column in Practical Boat Owner. So this morning I sat down to work at the large table in the lounge usually reserved for jigsaws (yes, really), but jigsaws, like other contact sports on board including dancing and bridge, are off limits on board at the moment due to extra hygiene precautions. 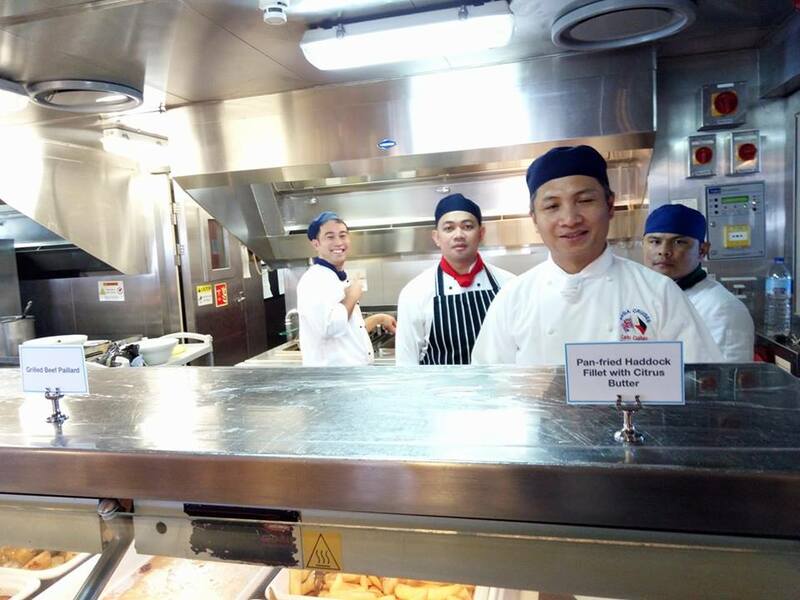 Norovirus is a cruise ship’s nightmare and there have been some cases on board, so that needed to be stopped fast and efficiently. Amazingly, the poor crewmember who seems to spend his entire day sanitising the handrails on stairs and corridors still manages a cheery ‘Hello Madam!’ every time I pass him. Temporary workstation on the jigsaw table. Nice view! I have an inside cabin this time, so prefer to work in the lounge. Sorry, I’m rambling again. The jigsaw table was a good place for me to sketch out and paint the cartoon. I’d already read the piece and spent a couple of days wrestling with an idea, which sort of takes shape as I go. By the time I’d photographed the finished piece with my phone and emailed it to the editor, I’d thought of a caption to go with it. It took a few attempts to get through but thank goodness for ship’s wifi – and how on earth would Columbus have got his head around that! Clingfilm on worktops stops plates sliding around when the sea is lumpy. Should work on yachts and small boats too I would think. Yours is the best bloggery I have ever read. Please keep on blogging. Love your news and, even more, much more, love the pictures. A lovely blog. I suspect in Columbus’ time the officers would shout instructions down to the helmsman. It would have been impossible to sail very close to the wind. With this arrangement.The next stage was to have a whip staff, which was a vertical lever slotted into the tiller which enabled the helmsman to stand on the next deck up. As ships got bigger ( especially warships) even this wasn’t good enough and the introduction of wheel steering which allows the helmsman to stand on deck and see the sails is generally considered to date from around 1703. Thank you Mike, much appreciated. Yes, that makes sense, and it always puzzled me why there was no tiller or wheel shown on early ship models. Not surprising that Santa Maria went aground (crew were drunk from partying ashore, according the log). It’s hard enough to steer at night when you know where you are!